From the Field: Quota International Canada, Did You Know? Quota International Premier Cyber Club members don’t just operate in cyber space – they have their feet right on the ground in the centre of a community that needs help. 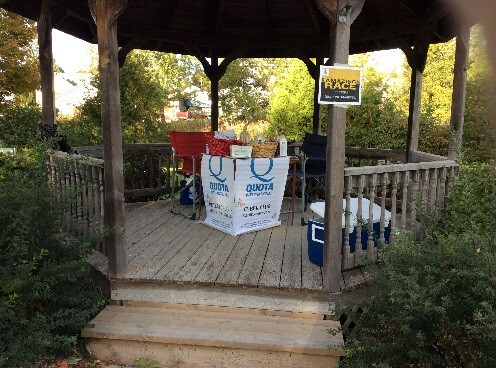 As Quota International’s first virtual club, the Premier Cyber partnered with Quota International of Peterborough, Ontario, Canada to sponsor a Pit Stop in the ‘Amazing Habitat Race Warsaw,’ a Habitat for Humanity event that raises funds for a building project in the village of Warsaw, near Peterborough. President Leah said that each club member has chosen a community project to focus their efforts on– the Habitat for Humanity project is President Leah’s choice. As a committee member for the Project, she has sought sponsorship from businesses for Pit Stops on a route through the village of Warsaw where the home will be built. Participating teams had to pledge $250 to enter, challenge sponsors gave $500 and each Pit Stop challenge cost $250.00. There were prizes for teams across the line, a seniors group provided pies for the Bar-b-que and the Lions Club did the Bar-b-que. The Cyber Club sponsored one Pit Stop and a created basket of treats at all Pit Stops with the Quota logo well displayed Each basket held information pamphlets, magazines and details about Quota’s international service. The result? $71,000.00 raised, 2 prospective members in another town for Premier Cyber, a Junior Quota Club in a local high school, and an invitation to President Leah to speak to Year Five students about giving back to the community. Well done, to our very new Canadian Cyber Club on their first service initiative! < Previous From the Field: Quota International Australia, Did You Know? Well Done Ladies love the banners and team work, Quota together with others making a great difference to the community.